Heraldic achievement of Hudson's Bay Company: Argent, a cross gules between four beavers passant proper. Crest: On a chapeau gules turned up ermine a fox sejant proper. Supporters: Two bucks proper. Latin Motto: Latin: pro pelle cutem, lit. 'skin for leather' apparently a play on Job, 2:4: Pellem pro pelle "skin for skin". After incorporation by English royal charter in 1670, the company functioned as the de facto government in parts of North America for nearly 200 years until the HBC sold the land it owned (known as Rupert's Land) to Canada in 1869 as part of The Deed of Surrender. During its peak, the company controlled the fur trade throughout much of the English- and later British-controlled North America. By the mid-19th century, the company evolved into a mercantile business selling a wide variety of products from furs to fine homeware in a small number of sales shops (as opposed to trading posts) across Canada. These shops were the first step towards the department stores the company owns today. In 2008, HBC was acquired by NRDC Equity Partners, which also owns the upmarket American department store Lord & Taylor. From 2008 to 2012, the HBC was run through a holding company of NRDC, Hudson's Bay Trading Company, which was dissolved in early 2012. Since 2012, the HBC directly oversees its Canadian subsidiaries Hudson's Bay (formerly The Bay) and Home Outfitters, in addition to the operations of Lord & Taylor in the United States. The Hudson's Bay Company bought Saks, Inc. (the operator of Saks Fifth Avenue) in 2013, German department store chain Galeria Kaufhof in 2015, online shopping site Gilt Groupe in 2015, and 20 former Vroom & Dreesmann sites in the Netherlands in 2015. Gilt Groupe was sold to online fashion store Rue La La in 2018. In the 17th century the French had a de facto monopoly on the Canadian fur trade with their colony of New France. Two French traders, Pierre-Esprit Radisson and Médard des Groseilliers (Médard de Chouart, Sieur des Groseilliers), Radisson's brother-in-law, learned from the Cree that the best fur country lay north and west of Lake Superior, and that there was a "frozen sea" still further north. Assuming this was Hudson Bay, they sought French backing for a plan to set up a trading post on the Bay, to reduce the cost of moving furs overland. According to Peter C. Newman, "concerned that exploration of the Hudson Bay route might shift the focus of the fur trade away from the St. Lawrence River, the French governor", Marquis d'Argenson (in office 1658–61), "refused to grant the coureurs de bois permission to scout the distant territory". Despite this refusal, in 1659 Radisson and Groseilliers set out for the upper Great Lakes basin. A year later they returned with premium furs, evidence of the potential of the Hudson Bay region. Subsequently, they were arrested for trading without a licence and fined, and their furs were confiscated by the government. Determined to establish trade in the Hudson Bay, Radisson and Groseilliers approached a group of English colonial businessmen in Boston, Massachusetts to help finance their explorations. The Bostonians agreed on the plan's merits but their speculative voyage in 1663 failed when their ship ran into pack ice in Hudson Strait. Boston-based English commissioner Colonel George Cartwright learned of the expedition and brought the two to England to raise financing. Radisson and Groseilliers arrived in London in 1665 at the height of the Great Plague. Eventually, the two met and gained the sponsorship of Prince Rupert. Prince Rupert also introduced the two to his cousin, King Charles II. In 1668 the English expedition acquired two ships, the Nonsuch and the Eaglet, to explore possible trade into Hudson Bay. Groseilliers sailed on the Nonsuch, commanded by Captain Zachariah Gillam, while the Eaglet was commanded by Captain William Stannard and accompanied by Radisson. On 5 June 1668, both ships left port at Deptford, England, but the Eaglet was forced to turn back off the coast of Ireland. The Nonsuch continued to James Bay, the southern portion of Hudson Bay, where its explorers founded, in 1668, the first fort on Hudson Bay, Charles Fort at the mouth of the Rupert River. (It was later known as Rupert House, and developed as the community of present-day Waskaganish, Quebec.) Both the fort and the river were named after the sponsor of the expedition, Prince Rupert of the Rhine, one of the major investors and soon to be the new company's first governor. After a successful trading expedition over the winter of 1668–69, Nonsuch returned to England on 9 October 1669 with the first cargo of fur resulting from trade in Hudson Bay. The bulk of the fur – worth £1,233 – was sold to Thomas Glover, one of London's most prominent furriers. This and subsequent purchases by Glover made it clear the fur trade in Hudson Bay was viable. The Governor and Company of Adventurers of England Trading into Hudson's Bay was incorporated on 2 May 1670, with a royal charter from King Charles II. The charter granted the company a monopoly over the region drained by all rivers and streams flowing into Hudson Bay in northern Canada. The area was named "Rupert's Land" after Prince Rupert, the first governor of the company appointed by the King. This drainage basin of Hudson Bay constitutes 1.5 million square miles (3.9×10^6 km2), comprising over one-third of the area of modern-day Canada and stretches into the present-day north-central United States. The specific boundaries were unknown at the time. Rupert's Land would eventually become Canada's largest land "purchase" in the 19th century. The HBC established six posts between 1668 and 1717. Rupert House(1668, southeast), Moose Factory (1673, south) and Fort Albany, Ontario (1679, west) were erected on James Bay; three other posts were established on the western shore of Hudson Bay proper: Fort Severn (1689), York Factory (1684) and Fort Churchill (1717). Inland posts were not built until 1774. After 1774, York Factory became the main post because of its convenient access to the vast interior waterway systems of the Saskatchewan and Red rivers. Called "factories" (because the "factor," i.e., a person acting as a mercantile agent did business from there), these posts operated in the manner of the Dutch fur trading operations in New Netherlands. By adoption of the Standard of Trade in the 18th century, the HBC ensured consistent pricing throughout Rupert's Land. A means of exchange arose based on the "Made Beaver" (MB); a prime pelt, worn for a year and ready for processing: "the prices of all trade goods were set in values of Made Beaver (MB) with other animal pelts, such as squirrel, otter and moose quoted in their MB (made beaver) equivalents. For example, two otter pelts might equal 1 MB". During the fall and winter, First Nations men and European trappers accomplished the vast majority of the animal trapping and pelt preparation. They travelled by canoe and on foot to the forts to sell their pelts. In exchange they typically received popular trade goods such as knives, kettles, beads, needles, and the Hudson's Bay point blanket. The arrival of the First Nations trappers was one of the high points of the year, met with pomp and circumstance. The highlight was very formal, an almost ritualized "Trading Ceremony" between the Chief Trader and the Captain of the aboriginal contingent who traded on their behalf. During the initial years of the fur trade, prices for items varied from post to post. In its trade with native peoples, Hudson's Bay Company exchanged wool blankets, called Hudson's Bay point blankets, for the beaver pelts trapped by aboriginal hunters. By 1700, point blankets accounted for more than 60% of the trade. The number of indigo stripes (a.k.a. points) woven into the blankets identified its finished size. A long-held misconception is that the number of stripes was related to its value in beaver pelts. A parallel may be drawn between the HBC's control over Rupert's Land with the trade monopoly and government functions enjoyed by the Honourable East India Company over India during roughly the same period. The HBC invested £10,000 in the East India Company in 1732, which it viewed as a major competitor. Hudson's Bay Company's first inland trading post was established by Samuel Hearne in 1774 with Cumberland House, Saskatchewan. In 1779, other traders founded the North West Company (NWC) in Montreal as a seasonal partnership to provide more capital and to continue competing with the HBC. 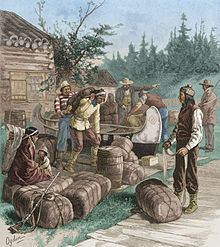 It became operative for the outfit of 1780 and was the first joint-stock company in Canada and possibly North America. The agreement lasted one year. A second agreement established in 1780 had a three-year term. The company became a permanent entity in 1783. By 1784, the NWC had begun to make serious inroads into the HBC's profits. Before the merger, the employees of the HBC, unlike those of the North West Company, did not participate in its profits. After the merger, with all operations under the management of Sir George Simpson (1826–60), the company had a corps of commissioned officers: 25 chief factors and 28 chief traders, who shared in the company's profits during the monopoly years. Its trade covered 7,770,000 km2 (3,000,000 sq mi), and it had 1,500 contract employees. The career progression for officers, together referred to as the Commissioned Gentlemen, was to enter the company as a fur trader. Typically, they were men who had the capital to invest in starting up their trading. They sought to be promoted to the rank of Chief Trader. A Chief Trader would be in charge of an individual post and was entitled to one share of the company's profits. Chief Factors sat in council with the Governors and were the heads of districts. They were entitled to two shares of the company's profits or losses. The average income of a Chief Trader was £360 and that of a Chief Factor was £720. Throughout the 1820s and 1830s, the HBC controlled nearly all trading operations in the Pacific Northwest, based at the company headquarters at Fort Vancouver on the Columbia River. Although claims to the region were by agreement in abeyance, commercial operating rights were nominally shared by the United States and Britain through the Anglo-American Convention of 1818, but company policy, enforced via Chief Factor John McLoughlin of the company's Columbia District, was to discourage U.S. settlement of the territory. The company's effective monopoly on trade virtually forbade any settlement in the region. :370 It established Fort Boise in 1834 (in present-day southwestern Idaho) to compete with the American Fort Hall, 483 km (300 mi) to the east. In 1837, it purchased Fort Hall, also along the route of the Oregon Trail. The outpost director displayed the abandoned wagons of discouraged settlers to those seeking to move west along the trail. The company's stranglehold on the region was broken by the first successful large wagon train to reach Oregon in 1843, led by Marcus Whitman. In the years that followed, thousands of emigrants poured into the Willamette Valley of Oregon. In 1846, the United States acquired full authority south of the 49th parallel; the most settled areas of the Oregon Country were south of the Columbia River in what is now Oregon. McLoughlin, who had once turned away would-be settlers as company director, then welcomed them from his general store at Oregon City. He was later proclaimed the "Father of Oregon". The company retains no presence today in what is now the United States portion of the Pacific Northwest. During the 1820s and 1830s, HBC trappers were deeply involved in the early exploration and development of Northern California. Company trapping brigades were sent south from Fort Vancouver, along what became known as the Siskiyou Trail, into Northern California as far south as the San Francisco Bay Area, where the company operated a trading post at Yerba Buena (San Francisco). These trapping brigades in Northern California faced serious risks, and were often the first to explore relatively uncharted territory. They included the lesser known Peter Skene Ogden and Samuel Black. The Guillaume Sayer Trial in 1849 contributed to the end of the HBC monopoly. Sayer, a Métis trapper and trader, was accused of illegal trading in furs. The Court of Assiniboia brought Sayer to trial, before a jury of HBC officials and supporters. During the trial, a crowd of armed Métis men led by Louis Riel, Sr. gathered outside the courtroom. Although Sayer was found guilty of illegal trade, having evaded the HBC monopoly, Judge Adam Thom did not levy a fine or punishment. Some accounts attributed that to the intimidating armed crowd gathered outside the courthouse. With the cry, Le commerce est libre! Le commerce est libre! ("Trade is free! Trade is free! "), the Métis loosened the HBC's previous control of the courts, which had enforced their monopoly on the settlers of Red River. Another factor was the findings of the Palliser Expedition of 1857 to 1860, led by Captain John Palliser. He surveyed the area of the prairies and wilderness from Lake Superior to the southern passes of the Rocky Mountains. Although he recommended against settlement of the region, the report sparked a debate. It ended the myth publicized by Hudson's Bay Company: that the Canadian West was unfit for agricultural settlement. In 1863, the International Financial Society bought controlling interest in the HBC, signalling a shift in the company’s outlook: most of the new shareholders were less interested in the fur trade than in real estate speculation and economic development in the West. The Society floated £2 million in public shares on non-ceded land held ostensibly by the Hudson's Bay Company as an asset and leveraged this asset for collateral for these funds. These funds allowed the Society the financial means to weather the financial collapse of 1866 which destroyed many competitors and invest in railways in North America. In 1869, after rejecting the American government offer of CA$10,000,000, the company approved the return of Rupert’s Land to Britain. The government gave it to Canada and loaned the new country the £300,000 required to compensate HBC for its losses. HBC also received one-twentieth of the fertile areas to be opened for settlement and retained title to the lands on which it had built trading establishments. The deal, known as The Deed of Surrender, came into force the following year. The resulting territory, now known as the Northwest Territories, was brought under Canadian jurisdiction under the terms of the Rupert's Land Act 1868, enacted by the Parliament of the United Kingdom. The Deed enabled the admission of the fifth province, Manitoba, to the Confederation on 15 July 1870, the same day that the deed itself came into force. 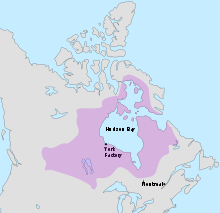 During the 19th century the Hudson Bay's Company went through great changes in response to such factors as growth of population and new settlements in part of its territory, and ongoing pressure from Britain. It seemed unlikely that it would continue to control the future of the West. In 1960, the company acquired Morgan's allowing it to expand into Montreal, Toronto, Hamilton, and Ottawa. In 1965, HBC rebranded its department stores as The Bay. The Morgan's logo was changed to match the new visual identity. By 1972 the last of the former Morgan’s stores had been rebranded to Bay stores. In 1970, on the company's 300th anniversary, as a result of punishing new British tax laws, the company relocated to Canada, and was rechartered as a Canadian business corporation under Canadian law, Head Office functions were transferred from London to Winnipeg. By 1974, as the company expanded into eastern Canada, head office functions were moved to Toronto. In 1978, the Zellers discount store chain made a bid to acquire the HBC, but the HBC turned the tables and acquired Zellers. Also in 1978, Simpson's department stores were acquired by Hudson's Bay Company, and were converted to Bay stores in 1991. (The related chain Simpsons-Sears was not acquired by the Bay, but became Sears Canada in 1978.) In 1991, Simpsons disappeared, when the last Simpsons store was converted to the Bay banner. In 1991, the Bay agreed to stop retailing fur in response to complaints from people opposed to killing animals for this purpose. In 1997, the Bay reopened its fur salons to meet the demand of consumers. In December 2003, Maple Leaf Heritage Investments, a Nova Scotia-based company created to acquire shares of Hudson's Bay Company, announced that it was considering making an offer to acquire all or some of the common shares of Hudson's Bay Company. Maple Leaf Heritage Investments is a subsidiary of B-Bay Inc. Its CEO and chairman is American businesswoman Anita Zucker, widow of Jerry Zucker. Zucker had previously been the head of the Polymer Group, which acquired another Canadian institution, Dominion Textile. On 26 January 2006, the HBC's board unanimously agreed to a bid of $15.25 CAD/share from Jerry Zucker, whose original bid was $14.75 CAD/share, ending a prolonged fight between the HBC and Zucker. The South Carolina billionaire financier was a longtime HBC minority shareholder. In a 9 March 2006 press release, the HBC announced that Zucker would replace Yves Fortier as governor and George Heller as CEO, becoming the first US citizen to lead the company. After Jerry Zucker's death the board named his widow, Anita Zucker, as HBC Governor and HBC Deputy-Governor Rob Johnston as CEO. On 16 July 2008, the company was sold to NRDC Equity Partners, a private equity firm based in Purchase, New York, which already owned Lord & Taylor, the oldest luxury department store chain in the United States. The Canadian and U.S. holdings were transferred to NRDC Equity Partners' holding company, Hudson's Bay Trading Company, as of fall 2008. On 24 January 2012, the Financial Post reported that Richard Baker (owner of NDRC and governor of Hudson's Bay Company) had dissolved Hudson's Bay Trading Company and that the HBC would now also operate the Lord & Taylor chain. At the time, the company was run by President Bonnie Brooks. Baker remained governor and CEO of the business and Donald Watros stayed on as chief operating officer. From 2004 to 2008, the HBC owned and operated a small chain of off-price stores called Designer Depot. Similar to the Winners and HomeSense retail format, Designer Depot did not meet sales expectations, and its nine stores were sold. Another HBC chain, Fields, was sold to a private firm in 2012. Established in 1950, Fields was acquired by Zellers in 1976. When Zellers was acquired by HBC in 1978, Fields became part of the HBC portfolio. Zellers is still owned by HBC but has been reduced to a chain of two liquidation stores following the sale of its lease portfolio to Target Canada in 2011. The Target Canada chain folded in 2015; these leases have since been returned to landlords or re-sold to other retailers. The new Hudson's Bay brand was launched in March 2013, incorporating a new logo with an updated rendition of the classic Hudson's Bay Company coat of arms, designed to be modern and better reflect the company's heritage. 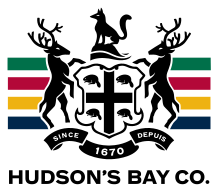 Following the IPO, HBC had also introduced a new corporate logo of its own (reviving a wordmark from the original HBC flag), but the new logo was not intended to be a consumer-facing brand. On 29 July 2013, Hudson's Bay Company announced that it would buy Saks Incorporated, operator of the US Saks Fifth Avenue brand, for US$2.9 billion, or $16 per share. The merger was completed on 3 November 2013. The company also stated that as a result of the purchase, Canadian consumers would see Saks stores arriving in their country soon. After the purchase was finalized, HBC had a net loss of $124.2 million in the 2013 3Q due to the cost of the purchase and promotions. In January 2016, HBC announced it would also expand deeper into digital space with its acquisition of online flash sales site, the Gilt Groupe, for US$250 million. In June 2018, HBC announced it sold Gilt Groupe to online fashion store Rue La La for an undisclosed sum. In early 2017, the Hudson's Bay Company made an overture to Macy's for a potential takeover of the struggling department store. Later, HBC also considered a purchase of the struggling Neiman Marcus Group Inc. It did not proceed with either deal. The company also has retail operations in Europe, including 20 Hudson’s Bay stores in the Netherlands and five Saks Off Fifth stores in Germany as well as the 135 stores of the Galeria Kaufhof department store chain in Germany. HBC announced its expansion into the Netherlands in May 2016 with the takeover of 20 former Vroom & Dreesmann (V&D) sites by 2017. V&D, a historic Dutch department store chain, went bankrupt and shut down in early 2016. HBC acquired the German department store chain Galeria Kaufhof and its Belgian subsidiary from Metro Group in September of 2015 for US$3.2 billion. On 1 November 2017, HBC received an unsolicited offer from Austrian firm SIGNA Holding for Kaufhof and other real estate. An unnamed source told CNBC that the value of the offer was approximately 3 billion euros. This information on the offer was also reiterated in a press release by activist shareholder Land & Buildings Investment Management who urged HBC to accept the offer; the company replied that the offer was incomplete and did not provide indication of financing for the deal. At the time, HBC had recently sold the building that houses its Lord & Taylor store on Fifth Avenue in Manhattan to WeWork Property Advisors after pressure from Land & Buildings Investment Management. The deal also included the use of floors of certain HBC-owned department stores in New York, Toronto, Vancouver and Germany as WeWork’s shared office workspaces. In late October, HBC was also considering the sale of the building that houses its flagship Vancouver store. By that time, CEO Gerald Storch was scheduled to leave HBC on 1 November, with Richard Baker taking over as interim CEO; both CFO Paul Beesley (who was replaced by Edward Record) and Don Watros, president of HBC International, had departed earlier. All left the company during a time of intense pressure on the executive and directors from Land & Buildings Investment Management, an entity that owns less than 5% of HBC shares. On 1 April 2018, HBC disclosed that more than 5 million credit and debit cards used for in-store purchases had been recently breached by hackers. The compromised credit card transactions took place at Saks Fifth Avenue, Saks Off 5th, and Lord & Taylor stores. The hack had been discovered by Gemini Advisory, which called the breach "amongst the biggest and most damaging to ever hit retail companies". In late 2018 Galeria Kaufhof and Karstadt merged as part of a spin off. In early 2019, HBC announced the closure of all 37 Home Outfitters in Canada and 20 of their 133 Saks Off 5th locations in the US. The HBC was the official outfitter of clothing for members of the Canadian Olympic team in 1936, 1960, 1964, 1968, 2006, 2008, 2010, 2012, 2014 and 2016. The sponsorship has been renewed through 2020. Since the late 2000s, HBC has used its status as the official Canadian Olympics team outfitter to gain global exposure, as part of a turnaround plan that included shedding under-performing brands and luring new high-end brands. On 2 March 2005, the company was announced as the new clothing outfitter for the Canadian Olympic team, in a $100 million deal, providing apparel for the 2006, 2008, 2010, and 2012 Games, having outbid the existing Canadian Olympic wear-supplier, Roots Canada, which had supplied Canada's Olympic teams from 1998 to 2004. The Canadian Olympic collection is sold through Hudson's Bay (and Zellers until 2013 when the Zellers leases were sold to Target Canada). Lord Sebastian Coe, chairman of the 2012 London Olympic Games Organizing Committee, who attended the Vancouver Olympics, noted that the Canadians were passionate in embracing the Games with their "Canada" hoodies and their red mittens (of which 2.6 million pairs sold that year). HBC has continued to produce these red mittens for subsequent Olympic Games. At the time of the donation, the appraised value of the records was nearly $60 million. A foundation, Hudson's Bay Company History Foundation funded through the tax savings resulting from the donation, was established to support the operations of the HBC Archive as a division of the Archives of Manitoba, along with other activities and programs. More than two kilometers of filed documents and hundreds of microfilm reels are now stored in a special climate-controlled vault in the Manitoba Archives Building. In the 18th and 19th Centuries, Hudson's Bay Company operated with a very rigid hierarchy when it came to its employees. This hierarchy essentially broke down into two levels; the officers and the servants. Comprising the officers were the factors, masters and chief traders, clerks and surgeons. The servants were the tradesmen, boatmen, and labourers. The officers essentially ran the fur trading posts. They had many duties which included supervising the workers in their trade posts, valuing the furs, and keeping trade and post records. In 1821, when Hudson's Bay Company and the North West Company merged, the hierarchy became even stricter and the lines between officers and servants became virtually impossible to cross. Officers in charge of individual trading posts had much responsibility because they were directly in charge of enforcing the policies made by the governor and committee (the board) of the company. One of these policies was the price of particular furs and trade goods. These prices were called the Official and Comparative Standards. Made-Beaver, the quality measurement of the pelt, was the means of exchange used by Hudson's Bay Company to define the Official and Comparative Standards. Because the governor was stationed in London, England, they needed to have reliable officers managing the trade posts halfway around the world. Because the fur trade was a very dynamic market, HBC needed to have some form of flexibility when dealing with prices and traders. Price fluctuation was deferred to the officers in charge of the trade posts, and the head office recorded any difference between the company's standard and that set by the individual officers. Overplus, or any excess revenue gained by officers was strictly documented to insure that it wasn't being pocketed and taken from the company. This strict yet flexible hierarchy exemplifies how Hudson's Bay Company was able to be so successful while still having its central management and trade posts located so far apart. 1683–85 James Stuart, Duke of York – resigned as governor to become James II, King of England. 1931–52 Sir Patrick Ashley Cooper – first governor to visit HBC operations in Canada. 2008 Anita Zucker – first female governor. ...Yielding and paying yearly to us and our heirs and successors for the same two Elks and two Black beavers whensoever and as often as We, our heirs and successors shall happen to enter into the said Countries, Territories and Regions hereby granted. Thanadelthur (c. 1697 — 5 February 1717) was a woman of the Chipewyan nation who served as a guide and interpreter for Hudson's Bay Company. Samuel Hearne (1745–92) was an English explorer, fur-trader, author, and naturalist. In 1774, Hearne built Cumberland House for the Hudson’s Bay Company, its first interior trading post and the first permanent settlement in present Saskatchewan. Isobel Gunn or Isabella Gunn (c. 1780 – 7 November 1861), also known as John Fubbister or Mary Fubbister, was a Scottish labourer employed by Hudson's Bay Company (HBC), noted for having passed herself as a man, thereby becoming the first European woman to travel to Rupert's Land, now part of Western Canada. Donald Smith, 1st Baron Strathcona and Mount Royal (6 August 1820 – 21 January 1914), at various times Chief Factor of the Labrador district, Commissioner of the Montreal district, and President of the Council of the Northern Department, who pacified Louis Riel during the Red River Rebellion of 1870, thus enabling the transfer of Rupert's Land from the HBC to the fledgling government of Canada. Later, he became Governor of the HBC. William Keswick (15 April 1834 – 9 March 1912) and grandson Sir William Johnstone Keswick (1903—90) served at HBC; the former as a director and later as governor from 1952 to 1965. The Keswick family are the Scottish business dynasty that controls Hong Kong-based Jardine Matheson, one of the original British trading houses or Hongs in British Hong Kong. 1551–1917 Muscovy Company Taken over by the Soviet Union and now operates as charity. 1672–1752 Royal African Company Replaced by the African Company of Merchants, which folded in 1821. ^ Spears, John (17 October 2012). "Hudson's Bay Co. to go public again". Toronto Star. Retrieved 25 October 2012. ^ "What does your motto 'Pro Pelle Cutem' mean?". HBC Heritage FAQ. Hudson's Bay Company. Retrieved 5 October 2015. ^ Rich, E. E. (April 1961). "Manitoba Pageant: Pro Pelle Cutem, The Hudson's Bay Company Motto". Manitoba Pageant. 6 (3). Retrieved 5 October 2015. ^ Shaw, Hollie (6 March 2013). "The Bay gets a new logo for first time in almost 50 years". Financial Post. Retrieved 20 August 2013. ^ "Contact Us". Hudson's Bay Company. Retrieved 14 October 2017. ^ a b c "The Royal Charter of the Hudson's Bay Company". HBC Heritage. Archived from the original on 7 October 2015. Retrieved 5 October 2015. ^ a b c "Our History: Business: Fur Trade: The Deed of Surrender". HBC Heritage. Retrieved 6 October 2015. ^ a b "Our History: Overview". HBC Heritage. Archived from the original on 1 October 2015. Retrieved 5 October 2015. ^ a b "Our History: Timelines: Early Stores". HBC Heritage. Archived from the original on 27 September 2015. Retrieved 6 October 2015. ^ a b "Hudson's Bay Company History". Funding Universe. Retrieved 2 September 2012. ^ a b Bell, Kevin (1 September 2012). "NRDC Buys Hudson's Bay, Says Lord & Taylor to Expand (Update2)". Bloomberg. Retrieved 16 July 2008. ^ a b "Saks snapped up by Canada's Hudson's Bay in $2.9bn deal". BBC News. 29 July 2013. Retrieved 29 July 2013. ^ a b "Hudson's Bay Company to Acquire Galeria Holding, Parent of Kaufhof, #1 Department Store in Germany" (Press release). Hudson's Bay Company. Archived from the original on 27 September 2015. Retrieved 5 October 2015. ^ a b "Hudson's Bay Company Completes Acquisition of GALERIA Holding". Hudson's Bay Company. 30 September 2015. ^ a b "Saks Owner Clinches Deal for Gilt Groupe". CBC News. 7 January 2016. Retrieved 23 October 2016. ^ a b "HBC to expand to the Netherlands". CBC News. 17 May 2016. Retrieved 17 May 2016. ^ a b "Rue La La Buys Gilt Groupe, Combining Two Popular Flash Sale Sites". Fortune. Retrieved 6 June 2018. ^ a b c Newman, Peter C. (1985). Company of Adventurers: Vol I. Viking. p. 64. ISBN 978-0-6708-0379-8. ^ a b c "Our History: People: Explorers: Radisson and des Groseilliers". HBC Heritage. Archived from the original on 16 October 2015. Retrieved 7 October 2015. ^ Newman 1985, p. 65. ^ Rich, Edwin Ernest (1958). 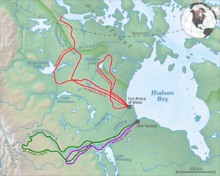 The History of the Hudson's Bay Company, 1670–1870. Vol. I. Hudson's Bay Record Society. pp. 36, 38, 42. ^ "1668: Des Groseilliers aboard the 12-metre ship Nonsuch travels to James Bay". HBC Heritage – Timeline. Retrieved 5 October 2015. ^ Rich 1958, pp. 38, 42. ^ "Rupert's Land". The Canadian Encyclopedia. Historica Canada. Retrieved 3 May 2017. ^ Voorhis, Ernest (1930). "Historic Forts and Trading Posts of the French Regime and of the English Fur Trading Companies". enhaut.ca/voor1. Government of Canada. Retrieved 24 April 2016. ^ Ernest, Voorhis (24 April 2016). "Historic Forts and Trading Posts of the French Regime and of the English Fur Trading Companies". enhaut.ca/voor1. Government of Canada (orig.). Retrieved 24 April 2016. ^ Voorhis, Ernest (1930). "Historic Forts of the French Regime and of the English Trading Companies". enhaut.ca/voor1. Government of Canada. Retrieved 24 April 2016. ^ "Hbc Heritage | The Standard of Trade". www.hbcheritage.ca. Archived from the original on 16 April 2016. Retrieved 24 April 2016. ^ "Our History: Business: Fur Trade: Trading Ceremony at York Factory, 1780s". HBC Heritage. Archived from the original on 13 March 2016. ^ "Our History: Business: Fur Trade: Standard of Trade". HBC Heritage. Archived from the original on 16 April 2016. ^ a b c d Newman, Peter C. (1986). Company of Adventurers (New ed.). Markham, Ont. : Penguin Books Canada. ISBN 978-0140067200. ^ Newman 1985, p. 352. ^ "Canadian Museum of Civilization Display". ^ "Our History: The Hudson's Bay Company Point Blanket: FAQs". HBC Heritage. Retrieved 6 October 2015. ^ Rich 1958, pp. 38, 42, 491. ^ a b Chichester, Henry Manners (1891). "Hearne, Samuel" . In Stephen, Leslie; Lee, Sidney (eds.). Dictionary of National Biography. 25. London: Smith, Elder & Co. p. 335. ^ a b "Our History: People: Explorers: Samuel Hearne". Hudson's Bay Company. Retrieved 14 November 2007. ^ Newman 1985, p. 354. ^ HBC Heritage. "Our History: Acquisitions: Fur Trade: The North West Company". Archived from the original on 13 January 2016. ^ "Early Trading Networks". Canadian Geographic magazine. Retrieved 6 October 2015. ^ a b Newman, Peter C. (1988). Caesars of the wilderness. Markham, Ont. : Penguin. ISBN 978-0140086300. ^ Galbraith, John S. (1957). Hudson's Bay Company As an Imperial Factor 1821–1869. Berkeley and Los Angeles: University of California Press. pp. 8–23. Retrieved 6 October 2015. ^ Morton, Arthur S.; Thomas, Lewis G. (1973) . A History of the Canadian West to 1870–71 (2nd ed.). Toronto, Ontario: University of Toronto Press. p. 690. ISBN 978-0-8020-4033-6. ^ Galbraith 1957, pp. 60–72. ^ Gibson, James R. (1992). Otter Skins, Boston Ships, and China Goods: The Maritime Fur Trade of the Northwest Coast, 1785–1841. Montreal, Quebec: McGill-Queen's University Press. pp. 60–61. ISBN 978-0-7735-2028-8. Retrieved 6 October 2015. ^ Mackie, Richard Somerset (1998). Trading beyond the mountains : the British fur trade on the Pacific ; 1793 - 1843 (Repr ed.). Vancouver: UBC Press. pp. 106–107. ISBN 978-0-7748-0613-8. ^ McCullough, A.B. (1996). Money and Exchange in Canada to 1900. Dundurn. pp. 230–232. ISBN 978-1-5548-8228-1. Retrieved 6 October 2015. ^ "Records of the International Finance Society". Archives Hub. Jisc. Retrieved 16 November 2018. ^ "John A. Macdonald". Canada History. Access HT. Archived from the original on 5 April 2007. Retrieved 17 November 2013. ^ "Hudson's Bay Company". The Canadian Encyclopedia. Retrieved 16 November 2018. ^ Owram, Doug (2007). Francis, R. Douglas; Kitzan, C. (eds.). The Promise of the West as Settlement Frontier. The Prairie West as Promised Land. Calgary, Alberta: University of Calgary Press. pp. 3–28. Retrieved 2 February 2015. ^ "Our History". Hudson's Bay Company. Retrieved 6 October 2015. ^ "Our History: People: Builders: Burbidge". HBC Heritage. Archived from the original on 26 September 2015. Retrieved 6 October 2015. ^ "Our History". ConocoPhilips Canada. Retrieved 6 October 2015. ^ Sawyer, Deborah C. (2 February 2006). "Dome Petroleum Limited". The Canadian Encyclopedia (online ed.). Historica Canada. Retrieved 17 June 2010. ^ "Our History: Acquisitions: Retail: Morgan's". HBC Heritage. Archived from the original on 6 October 2015. Retrieved 6 October 2015. ^ "Our History: Timelines: HBC: 1970". HBC Heritage. ^ Sweetman, Keri; Harrington, Denise (18 November 1981). "600 to lose jobs as Bay closes Shop-Rite stores". Ottawa Citizen. Retrieved 6 October 2015. ^ "Our History: Timelines: Acquisitions". HBC Heritage. Archived from the original on 27 September 2015. Retrieved 6 October 2015. ^ "HBC Heritage — The Robert Simpson Company". hbcheritage.ca. Retrieved 11 December 2018. ^ "The Robert Simpson Company Limited". HBC. HBC. Retrieved 22 August 2017. ^ a b Ray, Arthur J. (2 April 2009). "Hudson's Bay Company". The Canadian Encyclopedia. Historica Canada. Retrieved 6 October 2015. ^ a b "Hbc Heritage – Timeline". hbcheritage.ca. ^ a b "1991: Hudson's Bay Company ends its fur trade - CBC Archives". Canadian Broadcasting Corporation. Retrieved 10 January 2018. ^ a b "Hudson's Bay Company". Privco.com. Retrieved 7 October 2015. ^ Stauth, Hillary (9 March 2006). "Hudson's Bay Company Announces Realignment of Senior Management Team and Appoints New Board of Directors" (Press release). Hudson’s Bay Company. Archived from the original on 16 March 2006. Retrieved 6 October 2015. ^ Friend, David (16 July 2008). "New owner to spruce up Bay". Toronto Star. Retrieved 16 July 2008. ^ a b Weisblott, Marc. "Zellers will stick around Canada's three biggest cities after Target arrives". O.Canada.com. Postmedia Network. Retrieved 14 January 2013. ^ "Target Finalizes Real Estate Transaction with Selection of 84 Additional Zellers Leases" (Press release). Minneapolis, Minnesota: Target Corporation. 23 September 2011. Retrieved 26 September 2011. ^ "Zellers to close last 64 stores as Target moves into Canada". Toronto Star. 26 July 2012. ^ a b Strauss, Marina (17 October 2012). "HBC launches IPO as new rivals loom". The Globe and Mail. Toronto. Retrieved 24 October 2012. ^ "Hudson's Bay Eager to Log Onto New Era". Financial Post/National Post. Archived from the original on 16 May 2008. Retrieved 8 April 2008. ^ "Fields Stores to Flourish Again in Western Canada". Canada Newswire. 1 May 2012. Archived from the original on 6 June 2012. Retrieved 1 June 2012. ^ "Our History: Acquisitions: Retail: Fields". HBC Heritage. ^ "HBC store locator". Archived from the original on 11 March 2014. Retrieved 2 March 2014. ^ "Zellers store to stay open at Semiahmoo Shopping Centre". Archived from the original on 30 January 2013. Retrieved 14 January 2013. ^ "Target returns, auctions off leases on most Canadian properties". CBC News. Retrieved 8 May 2015. ^ Krashinsky, Susan (11 March 2013). "New logo, old name: The Bay returns to its roots". The Globe and Mail. Toronto. Retrieved 12 March 2013. ^ "Hudson's Bay Celebrates Its Past, Present and Future with Modern New Logo" (Press release). Hudson's Bay Company. Retrieved 6 March 2013. ^ Shaw, Hollie (13 March 2013). "The Bay gets a new logo for first time in almost 50 years". National Post. Retrieved 7 March 2013. ^ Evans, Pete (29 July 2013). "Hudson's Bay to bring Saks to Canada in $2.9B takeover". CBC News. Retrieved 6 October 2015. ^ "Hudson's Bay completes acquisition of Saks". Yahoo Finance. Associated Press. 4 November 2013. Retrieved 5 October 2015. ^ "No timeline for turnaround as HBC cuts deep". The Globe and Mail. 9 June 2017. Retrieved 10 January 2018. ^ a b "HBC mulls reported 3 billion euro offer for lagging European business". financialpost.com. 1 November 2017. Retrieved 10 January 2018. ^ Hodges, David (1 November 2017). "HBC should accept unsolicited $4.5B offer for German real estate: investor". ctvnews.ca. Retrieved 10 January 2018. ^ Hirsch, Lauren (1 November 2017). "Saks Fifth Avenue owner continues to face pressure, amid a bid for its European department store". CNBC. Retrieved 10 January 2018. ^ Kopun, Francine (1 November 2017). "Hudson's Bay urged to accept bid for German assets". Retrieved 10 January 2018 – via Toronto Star. ^ "HBC and WeWork Enter into Global, Multi-Faceted Strategic Relationship". businesswire.com. 24 October 2017. Retrieved 10 January 2018. ^ "Hudson's Bay Company Responds to Land & Buildings Press Release". businesswire.com. 2 November 2017. Retrieved 10 January 2018. ^ "HBC, investors split on unsolicited bid for German Kaufhof chain". The Globe and Mail. 1 November 2017. Archived from the original on 2 November 2017. Retrieved 10 January 2018. ^ "Hudson's Bay looks into selling flagship downtown Vancouver store". globalnews.ca. 30 October 2017. Retrieved 10 January 2018. ^ "Hudson's Bay CEO Gerald Storch steps down to focus on consultancy". consultancy.uk. Retrieved 10 January 2018. ^ Wattles, Jackie (2018). "Saks, Lord & Taylor breach: Data stolen on 5 million cards". CNNMoney. Retrieved 6 April 2018. ^ "HBC announces closure of all Home Outfitters stores in Canada". Daily Hive. 21 February 2019. Retrieved 22 February 2019. ^ "HBC Run for Canada". 2008. Archived from the original on 21 April 2008. ^ Strauss, Marina (28 November 2013). "Meet the man trying to shake up luxury retail in Canada". The Globe and Mail. Toronto. Retrieved 6 October 2015. ^ "Roots no longer outfitting Olympic teams, co-founder says". Toronto Star. 7 April 2008. Retrieved 6 October 2015. ^ "Canadian Olympic Gear, courtesy of The Bay & Zellers". Stylish.ca. Archived from the original on 9 April 2016. Retrieved 6 October 2015. ^ "Canadian Olympic gear made in China, MPs cry foul". CTV News. Bell Media Television. Retrieved 2 May 2008. ^ "First Nation alleges Olympic ripoff". CBC News. 7 October 2009. Retrieved 11 December 2015. ^ "Cowichan Tribes reach Olympic sweater deal". CBC News. 28 October 2009. Retrieved 11 December 2015. ^ "Sebastian Coe defends Vancouver Winter Olympics from critics". The Guardian. 18 February 2010. Retrieved 6 October 2015. ^ Coe, Sebastian (23 February 2010). "Winter Olympics 2010: Vancouver so passionate to embrace Games, says Seb Coe". The Daily Telegraph. London. Retrieved 6 October 2015. ^ "Putin in Canada House: 'Good luck, except in hockey'". CTV News. Bell Media Television. Archived from the original on 15 October 2015. Retrieved 6 October 2015. ^ "HBCA History". Hudson's Bay Company Archives. Government of Manitoba. Archived from the original on 25 September 2015. Retrieved 6 October 2015. ^ "HBC History Foundation". Hudson's Bay Company. Retrieved 6 October 2015. ^ "Hudson's Bay Company Archival records | United Nations Educational, Scientific and Cultural Organization". UNESCO. Retrieved 31 January 2018. ^ "Board of Directors". Hudson's Bay Company. Retrieved 7 January 2018. ^ Carlos, Ann M.; Lewis, Frank D. (September 1993). "Indians, the Beaver, and the Bay: The Economics of Depletion in the Lands of Hudson's Bay Company, 1700–1763". Journal of Economic History. 53 (3): 465–494. doi:10.1017/s0022050700013450. JSTOR 2122402. ^ a b c Judd, Carol (November 1980). "Native labour and social stratification in Hudson's Bay Company's Northern Department, 1770–1870". Canadian Review of Sociology and Anthropology. 17 (4): 305–314. doi:10.1111/j.1755-618X.1980.tb00707.x. ^ Taché, Alexandre Antonin & Cameron, Donald Roderick (1870). Sketch of the North-west of America. Montreal: John Lovell, p. 72. ^ "Our History: People: Governors". HBC Heritage. Archived from the original on 27 September 2015. Retrieved 7 October 2015. ^ "Our History: People: Governors: His Highness Prince Rupert of the Rhine". HBC Heritage. Archived from the original on 28 September 2015. Retrieved 7 October 2015. ^ "Rupert, Prince" (PDF). Hudson's Bay Company Archives. Retrieved 6 October 2015. ^ Miller, John (2000) . James II (revised, 3rd ed.). New Haven, Connecticut: Yale University Press. p. 44. ISBN 978-0-3000-8728-4. Retrieved 7 October 2015. ^ "Our History: People: Governors: John, Lord Churchill (later 1st Duke of Marlborough)". HBC Heritage. Archived from the original on 28 September 2015. Retrieved 7 October 2015. ^ "Churchill, John" (PDF). Hudson's Bay Company Archives. Retrieved 6 October 2015. ^ "Evance, Stephen (c.1655–1712), of the 'Black Boy', Lombard Street, London". History of Parliament Online. Retrieved 6 October 2015. ^ Courtney, William Prideaux (1899). "Trumbull, William (1639-1716)" . In Lee, Sidney (ed.). Dictionary of National Biography. 57. London: Smith, Elder & Co. pp. 265–267. ^ "Lake, Bibye (Sir)" (PDF). Hudson's Bay Company Archives. Retrieved 6 October 2015. ^ "Pitt, Benjamin" (PDF). Hudson's Bay Company Archives. Retrieved 7 October 2015. ^ "Knapp, Thomas" (PDF). Hudson's Bay Company Archives. Retrieved 7 October 2015. ^ "Lake, Atwell (Sir)" (PDF). Hudson's Bay Company Archives. Retrieved 6 October 2015. ^ "Baker, William (Sir)" (PDF). Hudson's Bay Company Archives. Retrieved 7 October 2015. ^ "Lake, Bibye" (PDF). Hudson's Bay Company Archives. Retrieved 6 October 2015. ^ "Wegg, Samuel" (PDF). Hudson's Bay Company Archives. Retrieved 6 October 2015. ^ "Lake, James Winter (Sir)" (PDF). Hudson's Bay Company Archives. Retrieved 7 October 2015. ^ "Mainwaring, William" (PDF). Hudson's Bay Company Archives. Retrieved 7 October 2015. ^ "Berens, Joseph" (PDF). Hudson's Bay Company Archives. Retrieved 7 October 2015. ^ "Our History: People: Governors: Sir John Henry Pelly, Bart". HBC Heritage. Retrieved 7 October 2015. ^ "Colville, Andrew" (PDF). Hudson's Bay Company Archives. Archived from the original (PDF) on 18 May 2015. Retrieved 6 October 2015. ^ "Shepherd, John" (PDF). Hudson's Bay Company Archives. Retrieved 7 October 2015. ^ "Berens, Henry Hulse" (PDF). Hudson's Bay Company Archives. Retrieved 7 October 2015. ^ "Head, Edmund Walker" (PDF). Hudson's Bay Company Archives. Retrieved 7 October 2015. ^ Sanders, Lloyd Charles (1895). "Northcote, Stafford Henry" . In Lee, Sidney (ed.). Dictionary of National Biography. 41. London: Smith, Elder & Co. pp. 194–199. ^ "Goschen, George Joachim" (PDF). Hudson's Bay Company Archives. Retrieved 7 October 2015. ^ Rea, J.E. (1990). "Colvile, Eden". In Halpenny, Francess G (ed.). Dictionary of Canadian Biography. XII (1891–1900) (online ed.). University of Toronto Press. ^ "Our History: People: Governors: Donald A. Smith". HBC Heritage. Archived from the original on 28 September 2015. Retrieved 7 October 2015. ^ "Smith, Donald Alexander" (PDF). Hudson's Bay Company Archives. Retrieved 7 October 2015. ^ "Skinner, Thomas" (PDF). Hudson's Bay Company Archives. Retrieved 7 October 2015. ^ Newman, Peter C. (2004). Here Be Dragons: Telling Tales Of People, Passion and Power. Toronto: McClelland & Stewart. p. 591. ISBN 978-0-7710-6792-1. Retrieved 9 October 2015. ^ "Our History: Business: Fur Trade: The Rent Ceremony". HBC Heritage. Retrieved 6 October 2015. ^ Dodge, Ernest S. (1979) . "Knight, James". In Hayne, David (ed.). Dictionary of Canadian Biography. II (1701–1740) (online ed.). University of Toronto Press. ^ "Our History: People: Associates: James Knight". HBC Heritage. Retrieved 7 October 2015. ^ Laughton, John Knox (1892). "Knight, James" . In Lee, Sidney (ed.). Dictionary of National Biography. 31. London: Smith, Elder & Co. p. 254. ^ Hayne, David, ed. (1979) . "Kelsey, Henry". Dictionary of Canadian Biography. II (1701–1740) (online ed.). University of Toronto Press. ^ "Our History: People: Women: Thanadelthur". HBC Heritage. Archived from the original on 22 December 2015. Retrieved 7 October 2015. ^ "Our History: People: Explorers: David Thompson". HBC Heritage. Archived from the original on 7 October 2015. Retrieved 7 October 2015. ^ Christy, Miller (1888). "Douglas, Thomas (1771-1820)" . In Stephen, Leslie (ed.). Dictionary of National Biography. 15. London: Smith, Elder & Co. pp. 350–353. ^ "Our History: People: Women: Isobel Gunn". HBC Heritage. Retrieved 7 October 2015. ^ Harris, Charles Alexander (1897). "Simpson, George" . In Lee, Sidney (ed.). Dictionary of National Biography. 52. London: Smith, Elder & Co. pp. 269–270. ^ "Our History: People: Builders: Sir George Simpson". HBC Heritage. Archived from the original on 22 December 2015. Retrieved 7 October 2015. ^ Martin, Joseph E. (2017). "Titans". Canada's History. 97 (5): 47–53. ISSN 1920-9894. ^ Rix, Herbert (1896). "Rae, John" . In Lee, Sidney (ed.). Dictionary of National Biography. 47. London: Smith, Elder & Co. pp. 151–153. ^ "Our History: People: Explorers: Dr. John Rae". HBC Heritage. Archived from the original on 9 October 2015. Retrieved 7 October 2015. ^ Hacking, Lamb, Norman R., W. Kaye (1976). The Princess Story: A Century and A Half of West Coast Shipping. Vancouver: Mitchell Press Ltd.
^ Watson, Robert (March 1928). The Anson Northup, First Steamboat on the Red River. The Beaver. pp. 162, 163. ^ The Beaver. June 1925. p. 121. "The Beaver: Exploring Canada's History". Periodical. An Illustrated Canadian History Magazine Published by the HBC 1920 – 1994. By CNHS Since 1994. Winnipeg. 1920. Newman, Peter C. (2002). An Illustrated History of the Hudson's Bay Company (Previously published as Empire of the Bay). Toronto: Penguin Canada/Madison Press. ISBN 978-0-6708-2969-9. Opp, James (2015). "Branding 'the Bay/la Baie': Corporate Identity, the Hudson's Bay Company, and the Burden of History in the 1960s". Canadian Historical Review. 96 (2): 223–256. doi:10.3138/chr.2675. Van Kirk, Sylvia (1984). "The Role of Native Women in the Fur Trade Society of Western Canada, 1670–1830". Frontiers: A Journal of Women Studies. 7 (3): 9–13. doi:10.2307/3346234. JSTOR 3346234. Van Kirk, Sylvia (1991). "The Role of Native Women in the Fur Trade Society of Western Canada, 1670–1830". In Strong-Boag, Veronica; Fellman, Anita Clair (eds.). Rethinking Canada: The Promise of Women's History (2nd ed.). Toronto: Copp Clark Pitman. ISBN 978-0-7730-5097-6. White, Bruce. M. (Winter 1999). "The Woman who Married a Beaver: Trade Patterns and Gender Roles in the Ojibwa Fur Trade". Ethnohistory. 46 (1): 109–147. JSTOR 483430.